Is it possible not to be enchanted by those Dandelions? 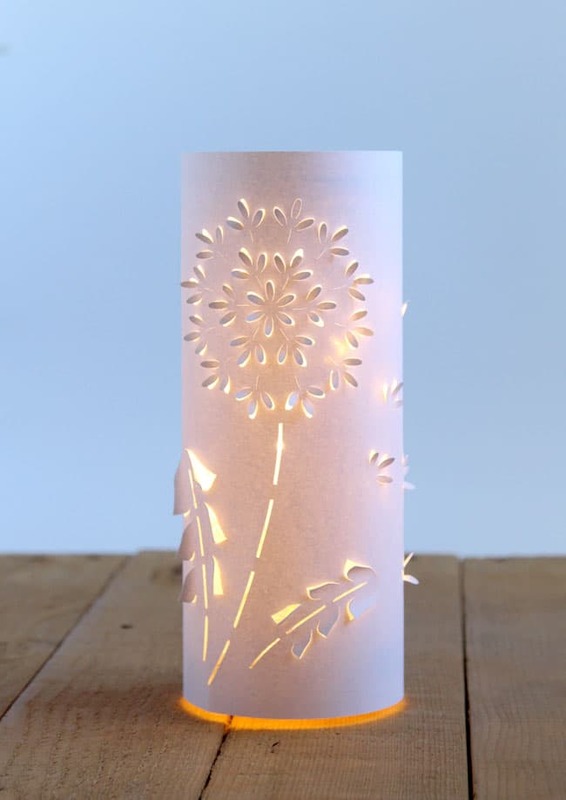 Today I am excited to share a new solution – see how we can make these magical Dandelion paper lanterns with …. 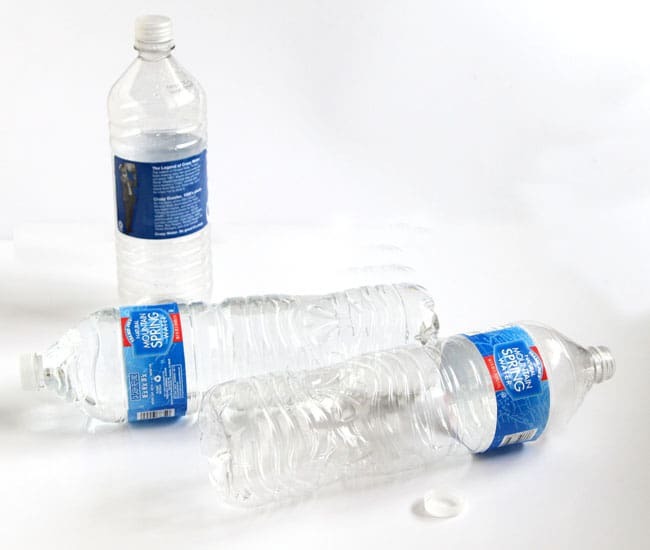 clear plastic water bottles from your recycle bin! Those with grooves are fine, they don’t show when lit. white paper : I used this great quality index card stock, which worked beautifully to get more of the dimensional effect. This paper is the perfect weight, not too flimsy like text paper, not too heavy yet hold its shape nicely. 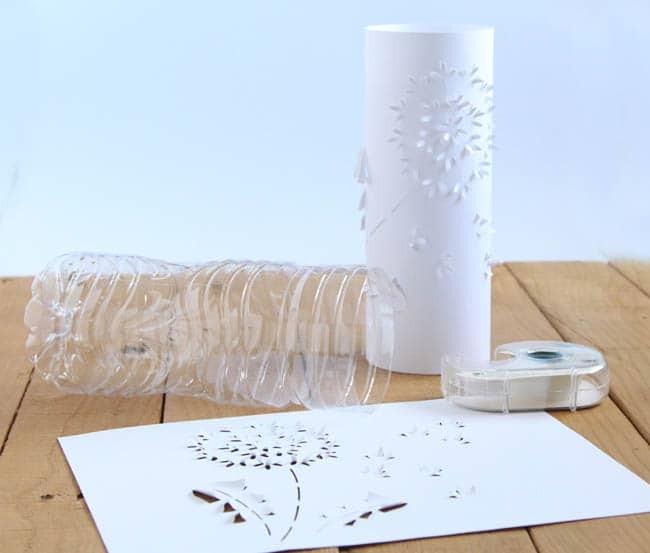 First we will remove the labels and cut the clear plastic bottle to about 8″ tall. I use 1 Litre and 1.5 Liter bottles here. They will provide structures for our paper lanterns. 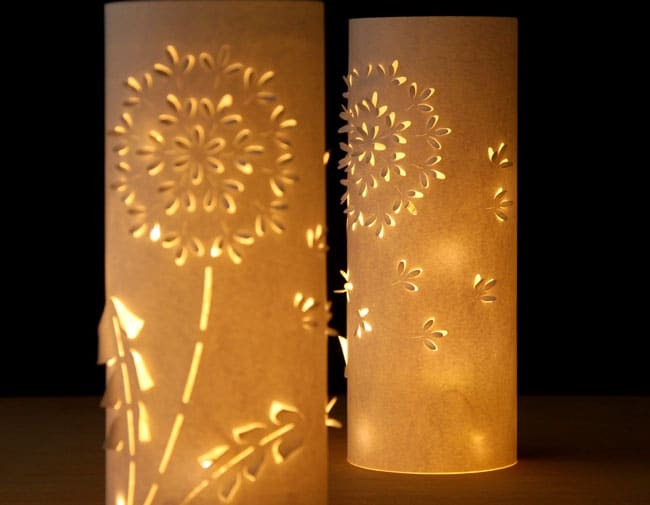 The paper cutting process is the same as the first paper flower lantern tutorial. 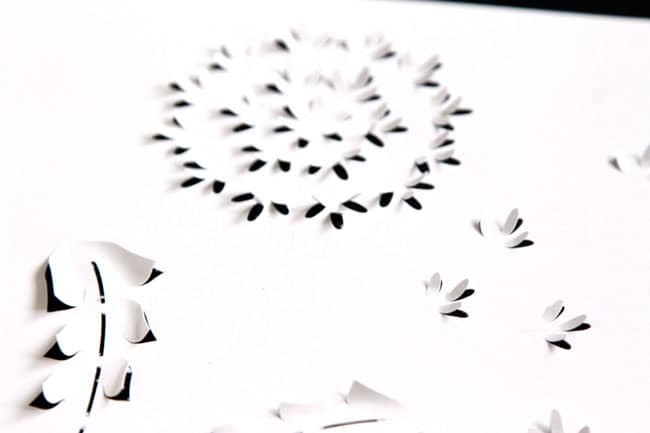 After cutting them by hand or on your Silhouette Portrait or Cameo, fold those petals up so the blossoms become three dimensional. 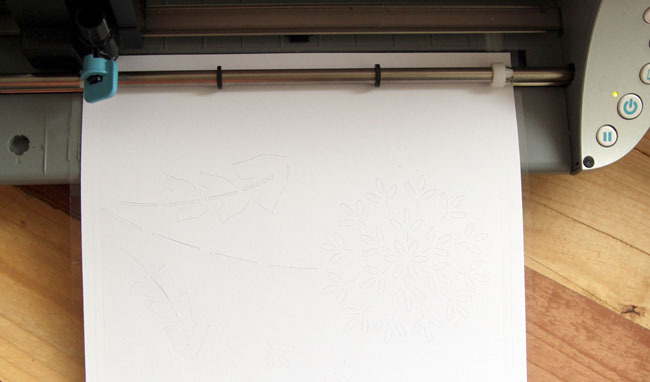 When a pattern gets a little more intricate, use a spatula or butter knife to help lift them off the cutting mat. Tape the paper to the outside of the plastic bottle. 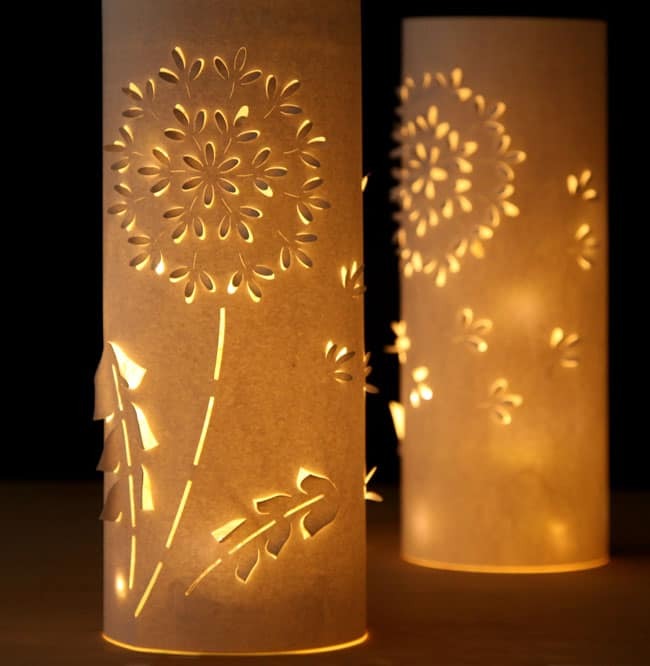 Now light the LED candles or LED Warm White String Lights, and drop them into the bottles inside our paper lanterns . Here are the free designs of these DIY paper lanterns for you to download! If you have trouble downloading, it might be a browser issue, please ask friends to download and email to you! It works , lots of downloads already! 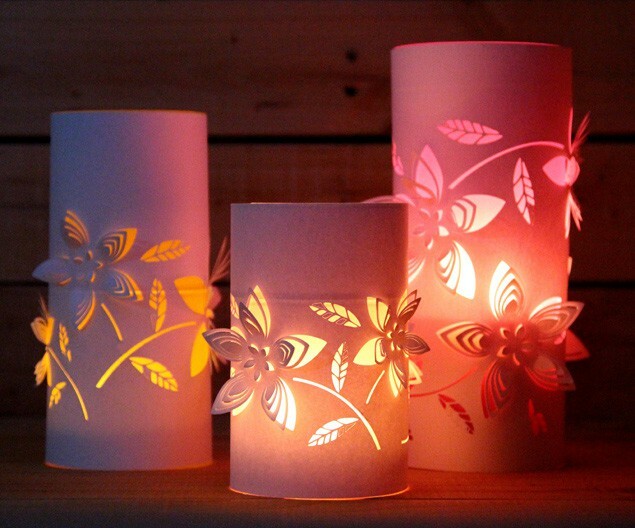 Dimensional paper flower lanterns with colored glow! 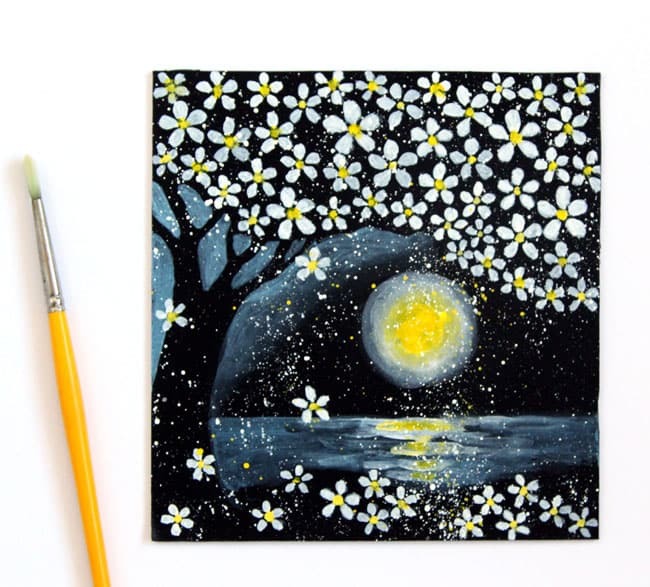 Paint a magical night landscape of Cherry blossoms in moonlight! 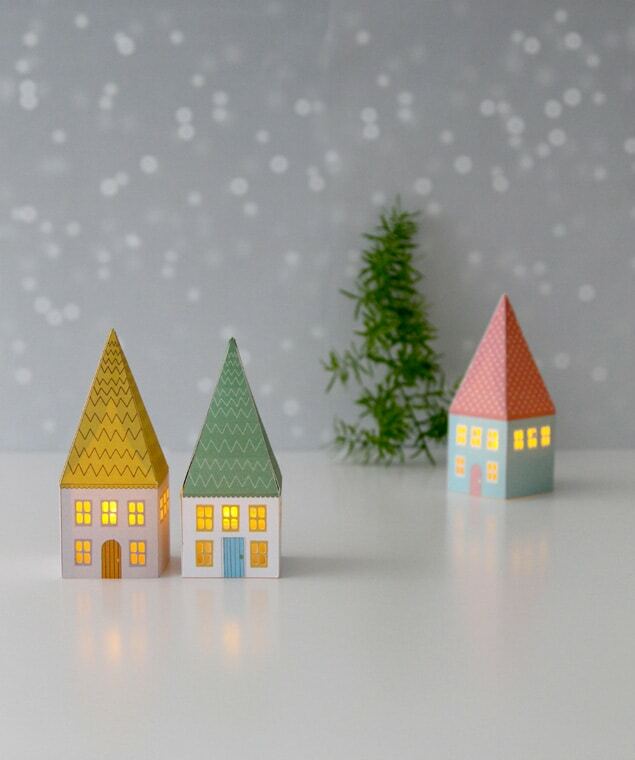 Mini paper house lanterns, perfect for fairies! 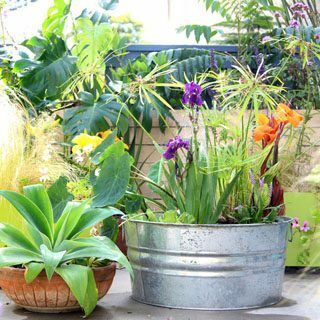 Wow – great idea! Those are so beautiful! They would be perfect as a wedding centerpiece! Another reason why I need to get a cricut! Get it! I have had my eye on getting a Cricut for some time, so I finally broke down and bought one. 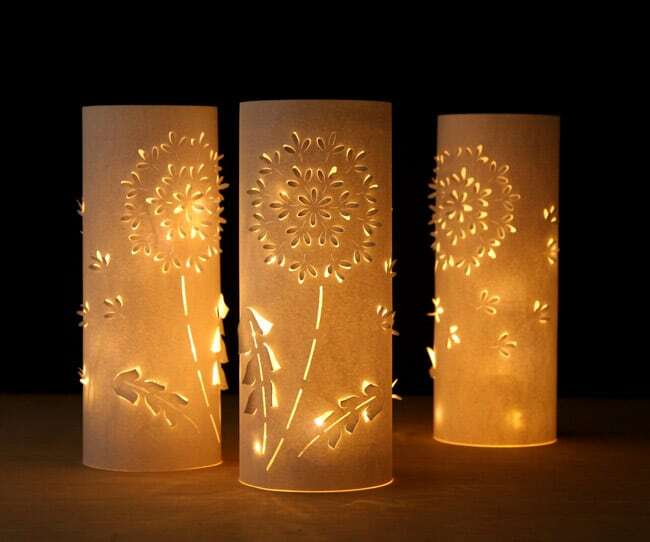 I LOVE IT, my brain is going to explode with all of the ideas and things I want to make including these cute dandelion lanterns. This is so gorgeous! These would be great for outdoor party decor and a bunch of them grouped together would be amazing as a wedding centerpiece! Wouldn’t these be just fabulous for a wedding?? I can’t wait to have one someday so I can use this idea! These are adorable!! Thanks for making it look so easy! There are really, really pretty and you captured their beauty with such wonderful pics! These look gorgeous, can’t wait to have a go at making my own! absolutely brilliant! any chance you’ll be creating an svg file of this beautiful design in the future? thanks a lot. 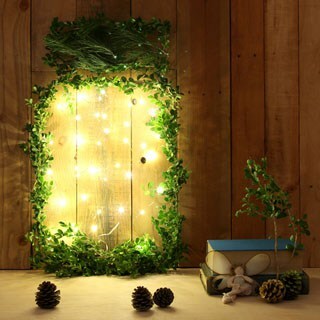 Love these lights. Anyway you can download the files in something other than STUDIO3? My program can’t open it. They look beautiful. My so is having his backyard wedding here this summer !! Great idea! 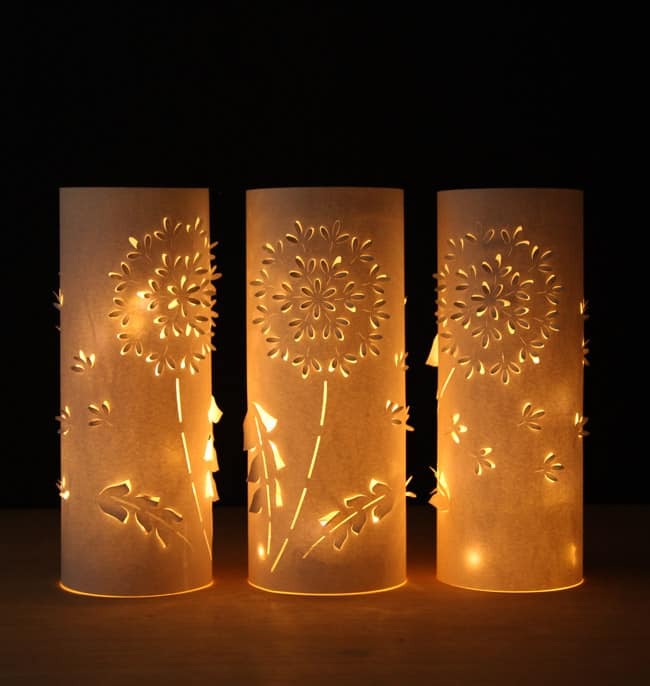 I love the soft glow that these give off, especially with the addition of colored tissue paper! Hello, I can’t see the usual yellow download box to download these stunning dandelion cutting files? Great paper lanterns, thank you for sharing. Wow, very beautiful thank you for sharing! These are just adorable. Do you do them all with white cardstock or do you use colors as well? I didn’t understand what one woman mentioned about “tissue paper” Thanks so much they are lovely. hi wilma! you can use any colored card stock.tissue paper is very thin, we can use it under the card stock to allow light to come through for a color glass effect. I just made one, they’re so easy, took me about 10 min. to make. I used my cricut.for the cutting and fairy lights. My husband didn’t believed me first when I told that I made it myself, even he was sitting next to me while I was making it..lol. But seriously it was done really fast ( I didn’t folded the petals) and it looks so beautiful. 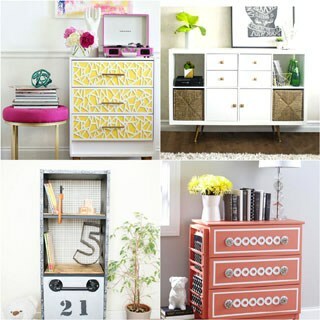 I am trying to download it to my Cricut with no success, have spent several frustrating hours trying. Can anyone please help. I need these as centerpieces for our Ladies Auxiary Dinner at the end of this month. Help! I have just spent a frustrating morning trying to download this, and other templates with no success. The search button doesn’t work, nor does your e-mail address present as valid. I’m so disappointed. Have followed the instructions and I’m told my subscription is confirmed, but I seem to be able to access nothing but the pretty pictures. So I tried download the template. Signed up for email newsletter as required. Confirmed email address. When I go back to the site and try the download link again it asks me to sign up again instead of allowing me to download. hi eric, after confirmation, a download link is emailed to you. do you see it in promotions, spam or trash folders? I saw the link to click on to confirm the email and I confirmed it (my mom did the same thing). Neither of us received a link to exclusive content. I have looked in every folder in my email including spam and trash and see nothing with a link to content. I’m having the same problem as another person who commented. When I hit the “download” it takes me to another page. No lanterns, nor templates. Yes, I’ve subscribed also, but I’m not able to get to the lantern pattern. I’ve emailed to myself, no luck. I did get the same error message about not having nothing to open the download with. I’m old, & stressed with trying to get the template.